Example code for FunnyBot and WhiskeyBot can be found in the Git Examples repository. FunnyBot is a simple joke telling bot which responds to a message like "tell me a joke". It searches the database for a joke and replies with it. 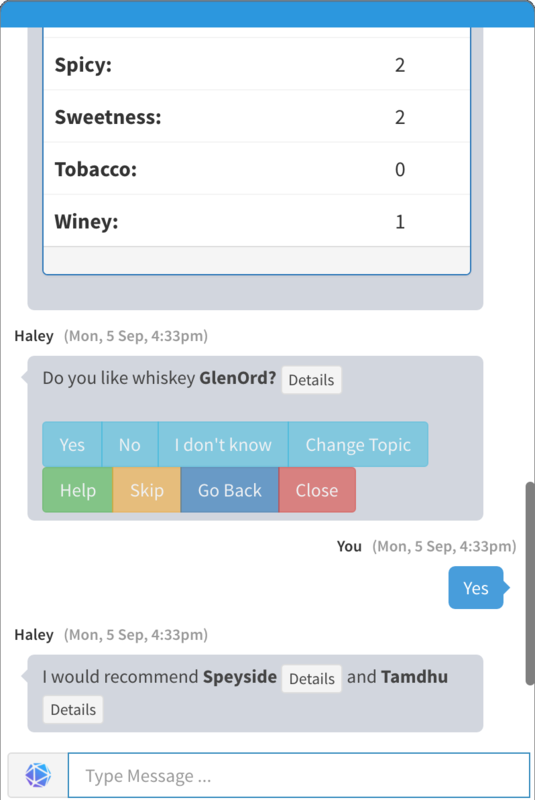 WhiskeyBot asks the user his or her preferences in whiskey in a dialog, and recommends a whiskey using a recommendation (prediction) model. WhiskeyBot is a good example of a dialog with structured questions, querying the database, calling a prediction model, and storing facts about users (to remember the preferences). Haley has an integrated storying telling and game system. 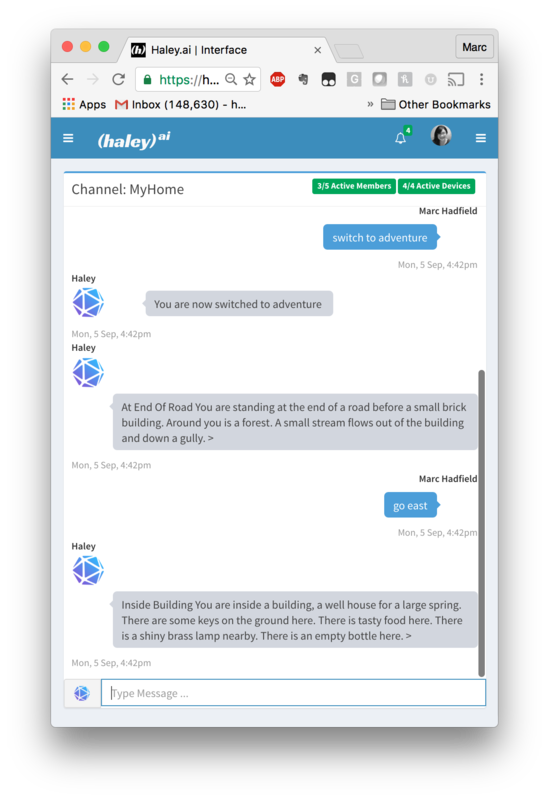 As Haley and Haley's bots operate on channels, this allows for a group story experience or game. The example screenshot to the right is showing the game "Colossal Cave Adventure" running in a Haley channel. "Colossal Cave Adventure" is the first computer adventure game and first work of interactive fiction. This game system is especially interesting for children's interactive stories, similar to the "Choose your Own Adventure" children's books. 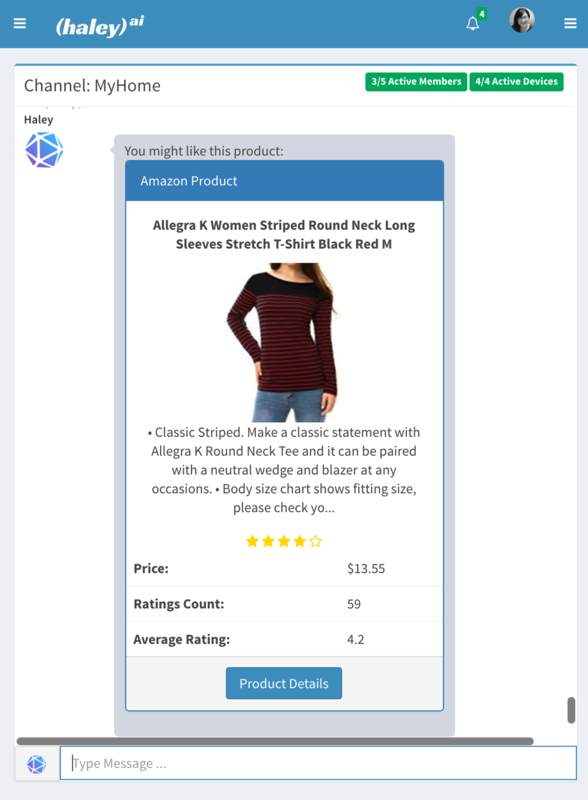 ShoppingBot is an example of an e-commerce bot for Haley. With ShoppingBot, a user specifies a product of interest, such as "black sneakers", and ShoppingBot searches for matching products, which are then shown to the user. In the example to the right, the user is looking for a women's shirt. The dialog can use facts about the user such as size, favorite color, brand preference to refine a search and feed into a recommendation model to predict whether the user will like the product.